This Akai cross-field portable is cute as and has survived with a clean battery compartment. Just the thing for the interrogation room! 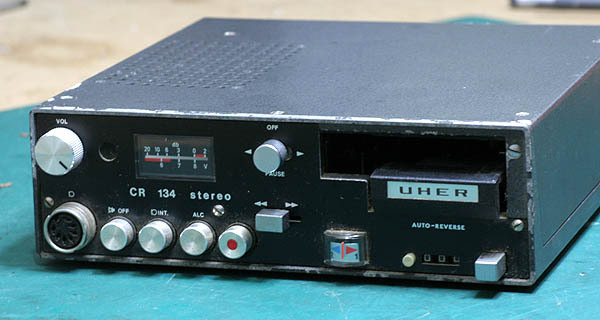 This Uher CR134 mono cassette recorder was the mainstay of journalists and reporters everywhere. Very intricate inside but well made and should be serviceable. These amps were a NZ only model and specs are elusive. There has been some controversy about the real power output so here's the real oil. Fred hooks up some cheap but good gear from the 90's and has a bit of fun. This TV is on display at the Museum für Kommunikation Frankfurt along with lots of other cool stuff. I got an unusual request from a customer wanting a turntable to turn into a clock. Scott chose a Bang and Olufsen Beogram 1200 I had been storing for parts. He sent me a picture of the finished result - awesome! I've had some interesting items in the past and it's worth keeping the pictures and information about them. Here are links to the archives. Or more correctly, how to make the force calibrations on the counterweight read correctly. Video instructions.